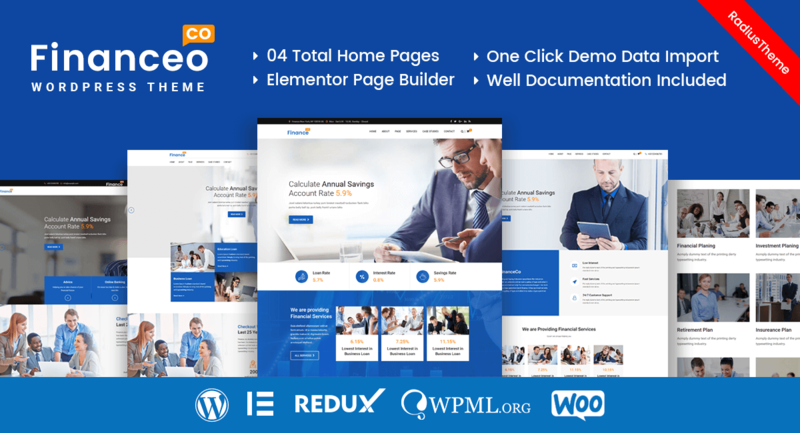 FinanceCo is a clean and modern design WordPress Theme. FinanceCo is suited for Consulting, Business website like Financial Advisor, Accountant, Consulting Firms, Insurance Company, Loan Management, Tax Advisor, Investment firm etc. This is a business Theme that is help full for online presence for Cunsulting Business and Financial Firms. This Theme included all necessary features like Service, portfolio, team profile, testimonial, Case Studies etc. It will best choice for your Consulting, Business & Finance WordPress Theme. 4 Home Pages (Multi Pages). 4 Home Pages (One Pages). 5 Case Study Layouts (06 Grid, 03 Isotope).